After a decade of declining commodity prices, negative investment trends debated mining legislation and increased overall risks, mining companies are struggling to survive searching for new sustainable investment options. 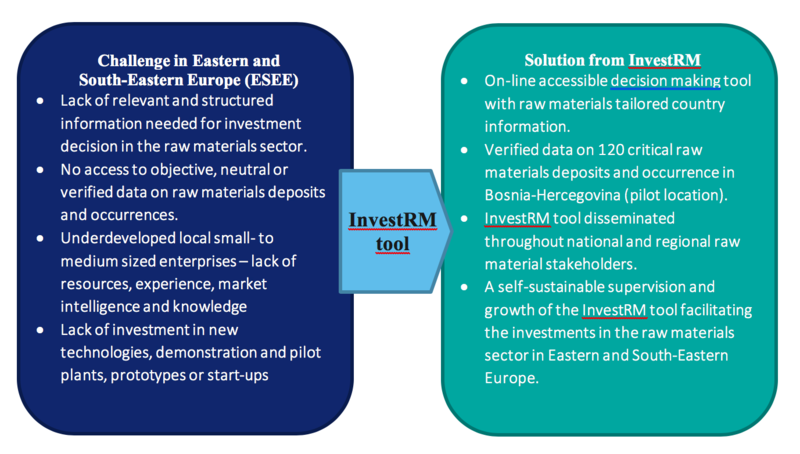 The InvestRM project will create a decision-making tool for raw materials companies and investors, mining institutes, technical universities, geological surveys, non-governmental association, the Bosnia and Herzegovina government and state institutions in order to facilitate investment in the raw material sector. The project is focused on Bosnia and Herzegovina due to its critical raw materials potential but will be fully transferable to other East and Southeast European (ESEE) countries. The InvestRM project aims to design an online accessible, decision-making tool for facilitating investment in the raw material sector. The tool will contain relevant, updated and RM-tailored country data (legal, social, economic), together with verified critical raw materials database. The project will deliver structured country data (entity-based) together with relevant and validated geo-information on 120 critical raw materials deposits and occurrences within Bosnia and Herzegovina: antimony, bauxite (as a potential source of rare earth elements – REE), fluorite and magnesite. One of the special tasks is the establishment of a constructive dialogue with minimum 40 SMEs and large companies throughout Banja Luka, Prijedor, Tuzla and Zenica, info-days in order to tailor the InvestRM decision-making tool.